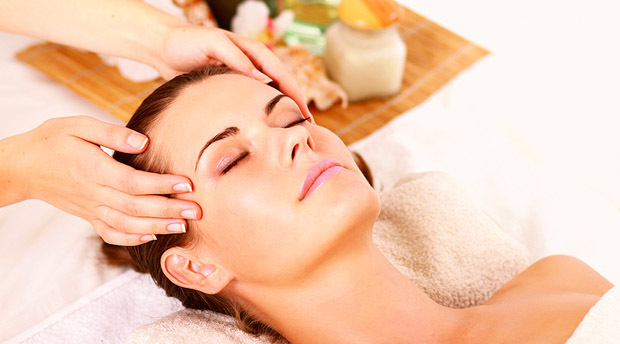 Indian Head Massage is a kind of massage that focuses on your upper back, shoulders, neck, and scalp. It has a very long history in India. Because of its great benefits, including body relaxation, diseases healing and fitness improving, it is becoming more and more popular in the west. Here we will give you a basic instruction on how to do an Indian head massage. The whole process can be divided into three parts. Firstly, it is the preparation work. A quiet and comfortable room is required. By playing some soft music and lighting some candles, you can relax yourself completely. Ask the recipient to take a seat and get relaxed. Tell them what you are going to do. And both of you need several deep breaths. Give them a comfortable shoulder massage. Put your hands on the shoulder and then squeeze the muscles between their neck and shoulder. Remember to increase the pressure each time. Now, it comes to their spine and the top of the shoulders. Use your thumbs to make small circles on each side of the backbone. After that, massage the shoulders by putting your forearms on their shoulders and moving back and forth repeatedly. Make circles like before between the neck and hair line. Two times are enough. Put your one hand on their forehead and the other one on the neck. Use your rear hand to lightly massage their neck. You need to open your hand and glide it up the back of the neck. In order to remove their tension completely, you should repeat this about five times. Gently move their head back and forth vertically. Never put too much pressure. And keep the motion in a reasonable range. Please do it 3 times. By putting your fingers on the head, you “wash” the hair. Light pressure is ok. You need to make sure that the heels of your hand are keeping in contact with their scalp. Rub the scalp. Keep one hand on their forehead and rub the scalp with the other one. Here you may need much pressure than before. After several times, just change the direction and repeat. Do some strokes that begin at the forehead and then towards to the back of the head. Small circles are also allowable. Remember to repeat it three times. It is a good choice for the clients who feel uncomfortable with the touch of their feet by strangers. For the same reason, if you like being massaged on the head, you may try Indian head massage. The whole process only needs half an hour, so never worry about the time. Invest yourself and lots of benefits are just around the corner.